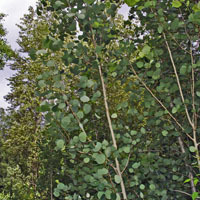 Quaking aspen often forms attractive thickets with leaves that flutter in the breeze making a pleasant rustling noise Although more common at higher elevations, and eastern Washington, occasional stands are found in the western Washington lowlands. These plants will sucker and spread so plant where this is a desirable trait. The tree appeals to people and wildlife alike.